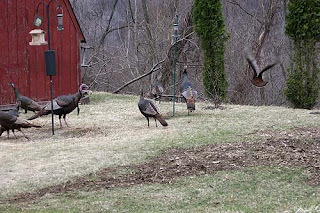 During the past few weeks, I noticed some strange looking birds in our backyard. They didn’t quite look like goldfinches, yet they often visited our thistle feeder. They also ate seeds on the ground, but they weren’t sparrows either. 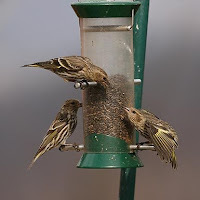 The other day I received an Audubon Society bulletin and learned that they are pine siskins. I wish I had known this during the backyard bird count so I could have included them. On Saturday, when they were visiting our feeders again I set up my camera and took some photos of them. I was quite excited that I could finally photograph again after a long winter trapped indoors. At the same time the siskins were at the thistle feeder, a male goldfinch showed up. Its eyes were quite shut from what I assume is conjunctivitis. A bit later, I spotted it on the ground eating seeds. I felt quite sorry for it since it will probably starve to death sooner or later. My husband cleaned out the feeder that same night to avoid spreading the disease to other birds.